Why the interpolation result of Spline with Tension in the Spatial Analyst is different from the that in the Geostatistical Analyst (both in ArcGIS 10), including their minimum values, maximum values, and isopach? Just as the maps below, with the same original date and corresponding parameter setting, fig. 1 is done by Spline with Tension in Spatial Analyst, fig. 2 is done by Spline in Geostatistical Analyst, and they are totally different. 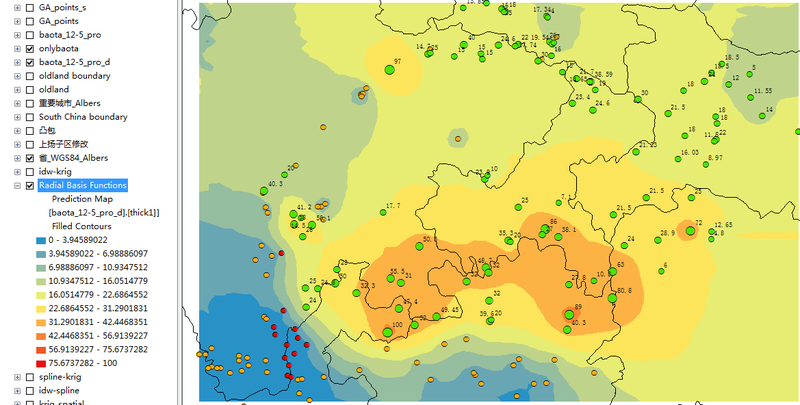 What does the prediction map in Geostatistical Analyst exactly mean? As we know, Spline is an exact interpolation method, but in Geostatistical Analyst, it seems not. Just as the yellow dots in the fig. 2, the original value of them are all 0, but why they appear in different color bands in the prediction map, which means that their predicted value are different with their original value. Why? I'm really confused about that. the yellow and red dots=0, and the values of the green dots are labeled in the figs, all of them are used to do the interpolation. Fig. 1 is understandable to me, which conforms with definition of Spline, and all the dots appear in the correct color areas that include their original data. I cann't understand fig. 2. Why does the same interpolation method in different tools lead to very different results? You can find Comparing interpolation methods in below link. 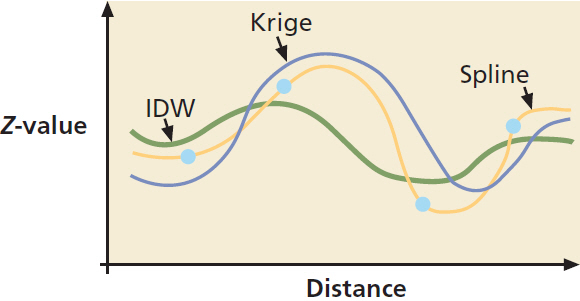 [link]http://pro.arcgis.com/en/pro-app/tool-reference/3d-analyst/comparing-interpolation-methods.html I hope this figure and below description can be helpfully [Comparing figure for IDW, Kriging and Spline] [ ]1 IDW and Spline are two deterministic methods that create surfaces from samples based on the extent of similarity or degree of smoothing. However, while a spline surface passes exactly through each sample point, an IDW will pass through none of the points. 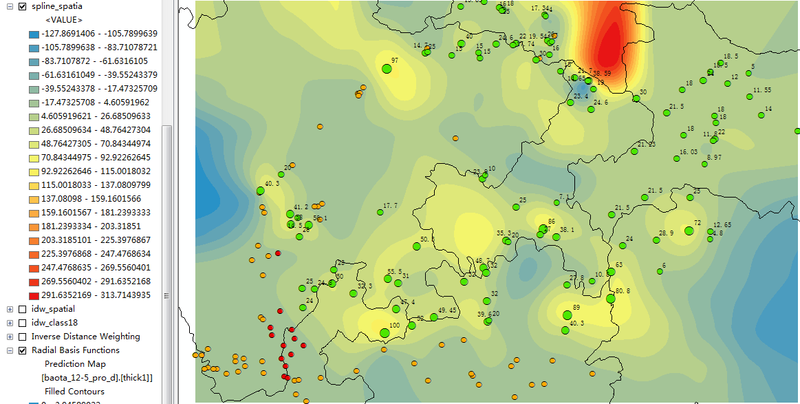 Kriging is a geostatistical method that uses a powerful statistical technique for predicting values derived from the measure of relationship in samples and employs sophisticated weighted average techniques. Not the answer you're looking for? Browse other questions tagged arcgis-desktop arcgis-10.0 interpolation geostatistical-analyst spline or ask your own question.